This guide will take you each step of the way through setting up the Windows 10 Mail App to work with your @comcast.net email address. Note: if you’re trying to access Comcast’s Webmail (and that’s all), you’ll only need to follow the first two steps – updating Windows 10. After that, you should be able to sign into Comcast’s Webmail without issue. The very first thing you’ll need to do is ensure your copy of Windows 10 has all of the Updates installed. There were several issues causing problems for Comcast.net email, for both webmail and the Windows 10 Mail App, until Microsoft released an update that includes a fix for the problems. To run the Update click the Windows 10 “Start” button and select Settings. Locate the Update & security section, and click/tap it. If there are any Updates waiting to be installed – install ’em :) If a reboot is required make sure to save any open work first. Use the Check for updates button until it says that your device is up to date. If you were having problems signing into Comcast’s Webmail, they should now be resolved. To set up the Mail App, keep reading. There are only two things you’ll need to know ahead of time in order to set up your Comcast email in Windows 10 – your comcast.net email address and the password associated with that account. If you know those two things, you’re ready go to! If you don’t have any accounts set up in Mail (yet), you’ll be presented with a Welcome screen. If this is the case, click the Get Started button and continue to the next step (#8). If you do have another email account already set up, instead of being presented with a Welcome screen, your Mail will open. If this is the case for you, jump down to step #9. Click the “Cog” or “Gear” icon located (by default) in the bottom corner of the left column in the Mail App (see screenshot below). Once the Settings menu appears, click the Accounts menu item. From here, click the + Add account button. Almost done! Make sure that all of lines that have “check boxes” do have checks in them. Click the Sign-in button. Finally, click the Done button. 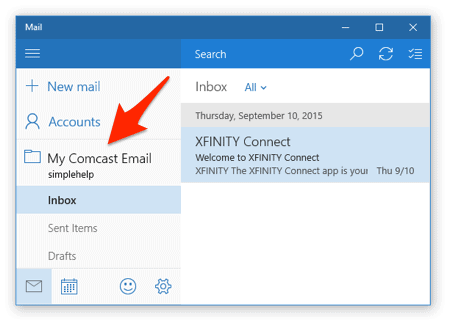 Congratulations – your Comcast email is now set up and ready to go in Windows 10! Thank you this was perfect! It solved my problem right away. Hi… I followed ALL the directions for Windows 10 and the Mail app, and the top of the screen has the flow of blue (I’m color blind) dots and it says “Not synced yet”. I know I have recent mail from Comcast, why isn’t it showing and why is it not syncing? My wife and i each have Comcast.net email accounts. We have been receiving mail for months using the Win10 Mail app and then several days ago it stopped working. Neither of us receives (nor can send) email from the app, although I still have normal mail send/retrieve from my yahoo and gmail accounts. I tried deleting both Comcast accounts and setting them up again using the Win10 App. The App reports that both accounts have been set up correctly, but still no mail is being delivered. I checked my account on Xfinity’s website and was able to retrieve email from them, so I know the account is still working, just not able to access it from Windows 10 Mail. How to fix? My Windows 10 mail app hasn’t worked since June 13!! Why can’t someone fix this??!! I’ve talked to several people and just get the runaround!! I followed all the instructions above and got the message “We couldn’t access this account, My Comcast Email”. You may need to update your password or give this account permission to sync to this device. Attention required. How do I set my email up to work? 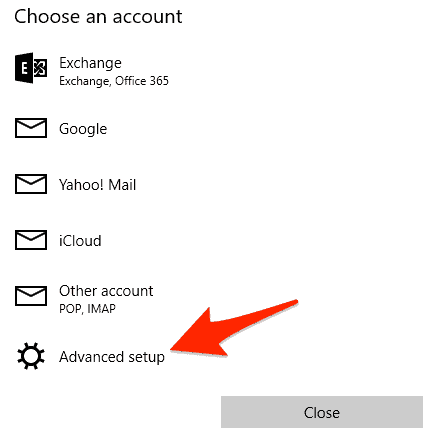 It is a perfect and easy guide to use a mail app in window 10. Somehow it is hard to use comcast.net but your content gives easy description toward the process step by step with an image. The way you had to describe the content is easier to follow and understand. It is very helpful and great help those who are getting a problem toward it.